Hellblade: Senua's Sacrifice is a dark fantasy psychological action-adventure game developed and published by the British video game development studio Ninja Theory. Self-described as an "independent AAA game", it was created by a team of approximately twenty developers led by writer and director Tameem Antoniades. It was released worldwide for Microsoft Windows and PlayStation 4 in August 2017, with an Xbox One version in April 2018. The game features support for virtual reality, which was added in an update in 2018. A Nintendo Switch version was released on 11th April, 2019. Inspired by Norse mythology and Celtic culture, Hellblade follows Senua, a Pict warrior who must make her way to Helheim by defeating otherworldly entities and facing their challenges, in order to rescue the soul of her dead lover from the goddess Hela. In parallel, the game acts as a metaphor for the character's struggle with psychosis, as Senua, who suffers from the condition but believes it to be a curse, is haunted by an entity known as the "Darkness", voices in her head known as "Furies", and memories from her past. To properly represent psychosis, developers worked closely with neuroscientists, mental health specialists, and people suffering from the condition. The game blends several genres, including hack and slash, puzzle solving, and psychological horror. Voice acting is an integral part of the game, while its cutscenes combine motion capture by Melina Juergens, and live action performances by other actors. Hellblade was a commercial success and was well received by critics, who praised it as a work of art and applauded its uncommon choice of revolving around psychosis, the quality and uniqueness of its approach of the condition, and its story and main character. Its overall presentation, along with Juergens' performance, were also considered superior in quality to what independent games usually provide, although its gameplay and other elements received some criticism. The game sold over a million copies across all platforms by June 2018. Hellblade: Senua's Sacrifice is divided in two types of gameplay: the first allows Senua to walk freely and interact with her surroundings. Those parts focus on either story via voiceover, as Senua travels from one location to another, or the resolution of a puzzle or challenge of some kind to progress further. She can use a capacity known as "focus", in reference to her tendency to see things differently from other people due to her condition, to trigger puzzle-related events. If she uses her focus on totems hidden throughout the game, it triggers a memory via voice-over of her friend Druth telling her of the stories of the Norsemen; activating all forty-four of them triggers a bonus cutscene shortly before the game's climax, that extends on Druth's backstory. Several areas feature their own exclusive mechanics or trials, such as reaching a safe zone in time before Senua dies, or using the focus ability to modify the structure of her surroundings. In addition, Hellblade features fights against malformed representations of Northmen who block her progression, including occasional bosses. During those fights, Senua has her sword drawn out, and is turned towards one of her enemies, on which the camera is automatically focused; she can use two kind of attacks, quick or heavy, kick an enemy to prevent it from blocking her attacks, parry, or dodge. She can also charge the opponent she is currently focusing on, to either get closer or directly attack or kick it. If she parries or dodges enough, she can use her focus ability in battle to move faster than her enemies or dissipate the shadows some of them are made of, which makes them impervious to regular attacks. Once she obtains Gramr, Senua can charge her heavy attacks for additional damage and parries more efficiently, both of which can allow her to use her focus ability. If Senua suffers a strong hit, or several hits in a row, she falls to the ground, and the player must press the corresponding button repeatedly as fast as possible before an enemy deals her a fatal blow; if she does not get back up in time, she dies. The closer she is to death, the harder it is for her to get back up; she can also die from a regular hit, if she was already very close to death. Hellblade does not feature any HUD or tutorials. Instead, Druth, Furies, or the Darkness, provide audio indications on game mechanics, and how to progress through levels and puzzles. The Furies also provide Senua advice in battle, notably warning her if an enemy is attacking from her back. They react when Senua takes damage, and panic heavily if she is close to death: how nervous they are when she takes a hit is representative of how much damage she can still take. The nature of most apparitions, events witnessed, or voices heard, is purposely left unclear, and can be interpreted as either an actual apparition by a spirit, a memory of Senua, or a trick created by the Darkness or one of the deceptive creatures she has to face. As such, the clues given during the game are not always reliable, except for Druth's: certain Furies try to demotivate Senua, or give false indications such as telling her she took the wrong way, or that she is walking into a trap. Another core mechanic is the possibility of permadeath, which is meant to delete the player's save data after they surpass a number of deaths. Set in the late 8th century, the game starts with Senua (Melina Juergens), a Pict warrior from Orkney arriving at the border of Helheim in a quest to save the soul of her dead lover, Dillion (Oliver Walker), from the goddess Hela. Senua believes she suffers from a curse, and hears "Furies", voices in her head commenting her every actions, notably one, the Narrator (Chipo Chung), who is aware of the player's presence and talks to them. She is also followed by the Darkness (Steven Hartley), a dark entity at the core of the curse. She carries Dillion's severed head to use it as a vessel to his soul, and is also guided by her memories of the stories of Druth (Nicholas Boulton), a former slave of the Norsemen well versed in their legends, now deceased, who became her friend and mentor during a year-long self-imposed exile. To enter Helheim, Senua defeats both the fire giant Surt and the spirit of illusions Valravn, but as she crosses the bridge to Helheim, is attacked by Hela, who defeats her with a single blow, shattering her sword. Barely surviving the encounter, she follows visions of Druth and a man-shaped light she believes to be Dillion to a great tree where she faces four challenges linked to her past, and is rewarded with the legendary sword Gramr, strong enough to kill gods. Meanwhile, Senua's backstory is unveiled through her hallucinations, revealing that her mother Galena (Ellie Piercy) suffered the same curse she did, but did not believe it to be dreadful. However, Senua's devoutly religious father Zynbel (also performed by Hartley) did, and burned Galena alive. Senua witnessed the event at age five, which caused her psychosis to worsen significantly and led her to convince herself her mother died willingly. Her father, convincing her that her condition was a curse, abused Senua emotionally and physically and isolated her from the rest of the world until she met Dillion when he visited her village. The two fell in love, and Senua left her father to be with him, as he saw her as different and misunderstood instead of cursed. However, after a plague killed many in Dillion's village, Senua, believing the fault to be hers, left in exile. When she returned a year later having hopefully left the Darkness behind, she found everyone killed by Norsemen who had invaded, sacrificing Dillion in a blood eagle to their gods. Remembering the stories of Druth, Senua departed on her journey to save Dillion's soul from the gods of the Norsemen. Ultimately, Senua fights against the influence of the Darkness and defeats the beast Garm. She then realizes the Darkness is a representation of her father's abuse and beliefs, and frees herself from the Furies. Soon after, she faces a legion of Hela's warriors in a hopeless fight, and is killed. In her final moments, she recalls Dillion telling her of the importance of the acceptance of loss. As the imagery of Helheim fades away, Hela drops Dillion's head into the abyss, but as the camera returns to her, Senua is standing in her place, with a dead Hela in place of Senua's body. Having accepted that it was never possible to bring her lover back, and that she is not responsible for his death or anyone else's, Senua frees herself from the Darkness' influence, and accepts the Furies not as a curse, but a part of who she is. She invites the player to follow her, while the Narrator says her goodbyes to the player. Hellblade was announced for the PlayStation 4 at Sony's Gamescom media briefing on August 12, 2014, where a trailer was shown. In a joint statement, Ninja Theory described the game as "an experience focused on delivering a deep character in a twisted world, with brutal uncompromising combat", and stated that they wanted to "make a smaller, more focused game experience that is uncompromising in its combat, art and story". The developers called it an "independent AAA game", with their goal being to make a game with all the qualities and production values of any AAA game on the market, but with creative freedom and an "indie spirit". The team eventually succeeded in releasing the game independently, but to achieve this could only release it via digital distribution. Hugues Giboire, art director of previous Ninja Theory game Heavenly Sword, returned to work on the game. A Microsoft Windows version of the game was announced on January 9, 2015. The game is powered by Unreal Engine 4, and was made by Ninja Theory with a team of around twenty developers. Its subtitle, Senua's Sacrifice, was announced in March 2016. Hellblade: Senua's Psychosis, a short documentary film included with the game, details the concept behind its story and inspirations, notably the team's study of mental illness. It was written and narrated by Antoniades, and edited by Juergens. The main inspiration of Senua's character was the Iceni queen Boudica, while her name came from Senuna, a Celtic goddess long lost to historians but re-discovered in 2002, whose name was at first read incorrectly as Senua. Based on what is believed of the way Celtic warriors looked, Senua was given war paints, and braided hair clumped with lime. Doing research to find the right angle for the character, the team realized that despite the Roman Empire being able to conquer nearly all of Europe, they were unable to conquer a group of Celts, known as the Picts, in the northern reaches of Great Britain. Towards the end of the 8th century, the first Vikings arrived in the lands of the Picts, more specifically the islands of Orkney, and quickly replaced them as the main population of the land. Based on the belief that the Norsemen were known for sacrificing the leaders of the tribes they had conquered to their gods, the game's director and lead writer Tameem Antoniades decided to use this as the basis for Senua's quest and trauma, and to have her find everyone in her village killed by the Norsemen and her lover sacrificed to Norse gods via the blood eagle, a ritualized method of execution whose authenticity is actually debated among historians. According to Antoniades, the team, researching Celtic culture and the Celts' views on mental disorder, found out that they used the term "gelt" for a man or woman who had been driven mad by a curse, grief, or the trauma of a battle, and that the gelt would take to a life in the woods in search of penance, punishment and purgatory; the team decided to make Senua a gelt, who had left her home in exile for those reasons. The character of Druth was based on both a real Irish Celt named Findan who was enslaved by the Norsemen in the 8th century, but eventually escaped and became a monk, and the Celtic tale of "a mad sinner who flees battle into exile and takes on a beastly nature, growing feathers on his body". The character was given a backstory similar to Findan's, a cloak featuring feathers, and was named after another word used by the Celts to describe mental disorder, "druth", meaning "fool" or "one who utters the words of gods". Antoniades and his team initially conceptualized Hellblade: Senua's Sacrifice as "a compelling, adult, fantasy game". The game was always supposed to be hinted as taking place in Senua's mind, but with her mental illness originally less central to the story. However, the team came to see it as an opportunity to raise awareness on psychosis; regarding the team's interest with the condition, Antoniades stated "It is easy to see the pain and suffering caused by physical diseases or physical trauma, it is not so easy to see the mental suffering or trauma or severe mental illness. But what if we could find a way to see it ? Games are capable of drawing you in for hours on end, playing the role of a character who's different from you, experiencing their perspective, and actively involving you in a world that functions with a different set of rules. [...] There are many things that happen in the world of Hellblade that make perfect sense within the context of Senua's mind. [...] To complete Senua's quest, you have to internalize and accept the logic and meaning behind these things to progress"; he notably felt that using the tendency of certain psychotics to see patterns others would not see or notice as a game mechanic to solve puzzles would provide a unique angle impossible in media other than video games. "It’s been refreshing to see a representation of psychosis in which the person isn’t just a sort of passive receptacle for madness. Senua is the hero of her own story, trying to make sense of her experiences and work her way through them – that’s incredibly de-stigmatising. In representations of mental illness onscreen, you usually have the illness first, and then a two-dimensional character attached to that. In this case, the character is fully-formed, and they are not defined by their condition." —Prof. Paul Fletcher, neuroscientist and psychosis expert, who worked on the game. Antoniades admitted that during his research, he "didn't have to look very far to discover my own ignorance of the subject". To portray psychosis properly, Ninja Theory "consulted world-leading neuroscientists and non-profit organizations like Wellcome Trust to properly capture the experience of psychosis and its devastating effects on the human mind". Antoniades "learnt that people can experience hallucinations and delusional beliefs without it being a problem – the illness comes when those experiences cause suffering. Often the recovery is not about curing yourself of hallucinations, but finding ways to live with them. That was a revelation to me". Experts who worked closely with the team include Professor Paul Fletcher from the University of Cambridge, and writer and psychologist Professor Charles Fernyhough from the University of Durham, an expert on voice hearing. Ninja Theory received funding for the game from the Wellcome Trust, who also helped them creatively in their depiction of mental illness, notably by helping them to get in contact with people suffering from it. They also worked with a "recovery college", an establishment which acts as both a health facility, and a college for its patients. Antoniades was marked by the story of "a girl who has to live with an angry voice screaming at her, slamming on her doors and walls 24 hours a day. That's someone who would often see corpses hanging in the room, so real that they would sometimes try to rescue them"; this inspired several events featured in the game as well. When working with experts, the team realized that "quite often, the illness comes not from the symptoms, but from the stigma, isolation, and mistreatment that comes about from the rest of society". This led the team to make Senua's father and the way he abused and isolated her during her youth the real nature of the Darkness which haunts her. To create the voices heard by Senua, the team "worked closely with a group of voice-hearers to try and get these sounding as realistic as possible"; Senua's visual hallucinations, including her flashbacks, or the way several elements of a level appear brighter than they should be, were also based on descriptions from people suffering from delusions. In June 2017, the team presented the near-finished game to several of the people suffering from mental illness they had collaborated with, as a way to see if the final result had "reflected their views or if it had misrepresented them". Senua's voice acting and motion capturing were performed by German freelance photographer and video editor Melina Juergens, who had never done either of those things prior to Hellblade. She was used by the team as a stand-in for Senua for several months while they perfected their motion capture techniques, and they eventually came to the conclusion that she could play the character in the finalized game. Game director and lead writer Tameem Antoniades stated that he knew her well enough to know that he did not have to teach her how to act, but to "relive her own internal pain". All cutscenes feature Juergens' vocal performance as she recorded it during the filming of her physical performance with motion capture suit and markers, rather than before or afterwards during a voice acting session. In addition to the camera placed in front of Juergens' face to capture her expressions for her animated counterpart, Antoniades used a portable camera to film the scenes as they appear in the final game. As they only had one camera, the team opted to make all the cutscenes be presented as one single long take, the objective being to make the viewer feel like "an observer, like a presence watching Senua throughout". Operating on a much smaller budget with Hellblade: Senua's Sacrifice than their previous games, Ninja Theory went out of their usual ways to film the cut scenes of the game. Instead of going to bigger studios and having a team of approximately 20 people film several actors together, like they did in the past, they filmed only Juergens in a small space, with only three other people needed on set: Antoniades directing and filming, one person to look after the audio, and one person to look after the motion capture process. To save more money, the team used equipment described by Antoniades as "fairly cheap", including material bought at a low price at IKEA and on Amazon. As a further cost-saving measure, they used their own boardroom for the motion capture scenes, rather than using external motion capture studio spaces. The helmet capturing Juergens' expressions and voice was provided to the team by Technoprops. The team opted to feature only two cameras on the helmet, as they felt that having four would be too uncomfortable for Juergens and impact her performance. The audio recording device was the most expensive part of the setup, and was placed around Juergens' forehead to avoid recording breathing sounds. Because all of Juergens' audio was recorded live, the team could not give her indications or reminders directly, or play music she would synchronize her performance with. For this reason, pre-recorded audio notes by Antoniades and excerpts from the soundtrack would be played at the same time on headphones both he and Juergens would wear, so they could act accordingly and in synchronization with each other. To feature the voices in Senua's head in a way that would be realistic regarding actual people suffering auditory hallucinations, the team, based on descriptions by Professor Charles Fernyhough, an expert on the subject, recorded several actors using binaural recording that also records the 3D position of sound, so the voices would sound as close or distant as the actors were to the microphone, replicating the way human ears perceive sounds. The team then invited voice hearers to listen to the result in order to give them feedback for future recordings. The original score for the game was composed by David García and Andy LaPlegua; the song "Just Like Sleep" by Passarella Death Squad is played during the final battle, and the song "Illusion" by VNV Nation plays during the ending credits. Hellblade was released for Microsoft Windows and PlayStation 4 via digital channels only on August 8, 2017. Following the period of timed console exclusivity for the PlayStation 4, A version for the Xbox One, with enhanced graphical support on the Xbox One X, was released on April 11, 2018. On July 31, 2018, an update added full virtual reality support via the HTC Vive and Oculus Rift headsets. On February 13, 2019, the game was announced for the Nintendo Switch later in Spring of same year. The game received "generally favorable reviews", according to review aggregator Metacritic. Its choice to depict and revolve around psychosis was applauded as a unique and interesting choice, as was the execution of those themes, and the idea of blending its approach with Norse mythology and the grief-ridden journey of Senua. Juergens' performance, and the game's sound, artistic direction, tense atmosphere, and low price, were also praised; the quality of its production value and graphics was singled out as superior to what independent games usually offer. Reception of the combat and puzzles were more mixed, with several reviewers complaining about combat being too repetitive and simplistic, the lack of variety in the enemies, and about the puzzles being redundant. Brandin Tyrrel of IGN praised the story, sound, directing, art direction, voice acting, music, and innovative presentation, and stating "it unfolds like a beautiful, dark, tense visual novel, placing the excellently raw, human performance of its main character front and center on her journey into the land of the Northmen. Her story is one of confusion, sadness, fear, and loss, and it’s punctuated by moments of beauty, and strength that has left a lasting impression on me." He added "As impressive as [Hellblade's] story is, Ninja Theory’s smart design reinforces the sensory nature of the harrowing tale through subtle and intuitive mechanics [...] Its incredibly smart use of audio and visual distortion and trickery to convey the frightening effects of psychosis, hallucinations, and delusion, are married with the gameplay elements for an experience that rarely ever grapples over whether it’s a game or a story". Brad Shoemaker of Giant Bomb stated as a narrative effort, its success was "almost unparalleled in the medium". He applauded the story, sound, characters, graphics, Juergens' performance and "piercing intensity". He appreciated the less artistic elements, but felt that the gameplay for battles was "usually satisfying but can also feel like a chore in confined spaces". However, the described the boss fights as "all unique and exceptionally memorable". Alice Bell of VideoGamer.com gave the game a 9 out of 10, praising its "incredibly compelling story", "fast, stylish combat", and "beautiful and horrible audio and visual design". "Hellblade's gameplay mechanics are few and relatively straightforward--though at half the price of most games with this quality of production, that's easier to forgive--but as a narrative effort its success is almost unparalleled in the medium." In a positive review, Leif Johnson of PC Gamer praised Hellblade: Senua's Sacrifice for its themes, presentation and story, but complained that the "inspiration doesn't carry over to the actual fights. [...] I frankly found it kind of dull in the one-on-one duels at the start, and it didn't help that the enemies sometimes seem to skip a few animations when reacting to attacks. Nor does it help that there's precious little variation in the foes themselves, who almost always show up as tall, shirtless warriors with deer-skull helmets or as beefy berserker shamans. By the end of the first hour, you've basically seen every non-boss you're going to see". He did, however, consider combat to get much better once Senua has to face many enemies at once. In one of the rare publications to give the game a somewhat negative review, Edge was unhappy with the game's depiction of Senua's condition. 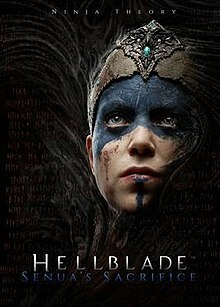 Several reviewers were less enthusiastic, with most criticism directed at the gameplay, fights and puzzles; however, most of them still praised Hellblade as a work of art. Among those were Game Informer's review, who found Hellblade to be "undeniably memorable, telling a compelling tale that explores subject matter many consider taboo". However, he believed that the gameplay suffered from the game's themes. Unaware of the fake nature of the game's supposed permadeath, he complained that it was too unclear how close to a permanent game over he was, and felt the sense that he was in "frustrating". He also found the puzzles tedious, and believed that the idea of the fight sequences allowing certain enemies to be offscreen translated poorly to gameplay. Eurogamer ranked the game ninth on their list of the "Top 50 Games of 2017", GamesRadar+ ranked it 16th on their list of the 25 Best Games of 2017, and EGMNow ranked it 19th in their list of the 25 Best Games of 2017, while Polygon ranked it 24th on their list of the 50 best games of 2017. The game received nominations for "Best PC Game", "Best PlayStation 4 Game", "Best Action-Adventure Game", "Best Graphics", "Best Story", and "Most Innovative" (the latter for which it became a runner-up) at IGN's Best of 2017 Awards. The game's depiction of psychosis was applauded, and often described as the game's greatest quality. Several media outlets and reviewers analysed the game's depiction of psychosis in more detail: it was noted that all parts of the game, including the fights and puzzles, were made to further the depiction of Senua's psychosis and revolved around her condition. Paul Fletcher, a neuroscientist and psychosis expert at the University of Cambridge who worked on the game, said that "It’s been exciting to see Senua received so positively by those who have lived with experiences of psychosis". Michael Briers of PlayStationLifeStyle.net, stated that, "by working closely with neuroscientists and those unfortunate few who have been diagnosed as psychotic, Hellblade carefully avoids those cheap, half-assed tropes that render a character insane and, therefore, woefully one-dimensional. Not only does it act as a disservice to those who suffer with mental illness, this practice of painting in broad strokes only minimizes the room for nuance, but Senua’s Sacrifice boldly cuts through the white noise". Leif Johnson of PC Gamer praised the gripping depiction of a character suffering from psychosis, stating "Ninja Theory uses haunted eyes to full effect in long, moody closeups peppering the narrative. [Senua] peers not only into the darkness, but seemingly past the camera, past the screen. Looking back, I found depths of despair and anger there that were sometimes hard to meet head on [...] Some people would crumble under such pain. But still Senua fights. It's a little inspiring." Alice Bell of VideoGamer.com noted that although Senua's psychosis is a cause of tragedy in her life, the game also depicted her condition as something that can bring her contentment, stating that her hallucinations are sometimes "actually lovely too, reflecting that psychosis can manifest as colour and beauty." Regarding the story as a whole, she stated "you [the player] learn about the trauma Senua has faced, made greater by her struggles with her own mental health and others' lack of understanding of it. Great care has been taken, with input every step of the way from psychologists and people who have experienced psychosis, to give as faithful a representation of it as possible. The hardest battles are fought in the mind, says Dillion, although Senua has physical battles as well". Mollie L Patterson of Electronic Gaming Monthly declared that "while I can’t speak to that side of things from personal experience, I can tell you that I was legitimately affected by [Senua's] condition at times. Playing a good portion of the game with headphones on, quiet moments were often broken by the never-ending chatter of those other selves conflicting in their thoughts, with some wanting to help their host in her quest, and others constantly telling Senua (and you) that she was wrong in her choices, that she was destined to failure, or that it was all hopeless. It’s hard to explain how powerful those words can be, even as a player detached from Senua’s condition, and it was one of many elements that helped form a bond between us. "It's very hard to represent what this experience is like, partly because it's such a personal, intense, emotional experience. [...] What they've come up with is so compelling, it's by far the best representation I've heard of what these experiences are like." —Prof. Charles Fernyhough, expert on voice hearing, on the game's portrayal of the voices in Senua's head. Shoemaker also stated "Hellblade's single most powerful trick is a near-constant stream of voices in Senua's head, recorded with a spatial audio technique so they feel like they're all around you, nagging at you, undermining your decisions and your confidence. These voices are frequently in conflict with what you're doing and even with each other; one side can be encouraging you while the other mocks you mercilessly. The effect is striking. Over time Senua's pain becomes palpable, incontestable, especially as the stress worsens the longer these voices harangue you, the more vicious and deranged they become. It's important to remember that you as the player, though, have the luxury of turning them off whenever you want. Hellblade's robust bag of psychological tricks and the sheer fact of Senua's distressing reality result in the game's uncommon ability to capture the feelings of worthlessness, lack of control, of being misunderstood and shunned, the strange mix of hope and despair that can accompany a debilitating mental illness". Not all media outlets were satisfied with the game's depiction of the condition. In an article he published to criticize the game, Mic gaming editor Jason Faulkner, who had experience working with the mentally ill, praised Senua's character, but was highly critical of the game, stating that it should have focused on helping people to truly understand psychosis, and have the condition be "focal and explicit", instead of representing it metaphorically: "If you go into the game without any background information, you might assume that Senua is living with delusions and Norse mythology-inspired hallucinations — or you might think that she’s being haunted by demons and ghosts. [...] The portrayal of Senua’s mental illness would be better served by showing both sides of her story: what’s in her head and what’s actually happening." He also stated that the game "stifles the opportunity to inject commentary about the broader picture of mental health care", notably by not depicting caregivers or other people dedicated to helping those with mental illness in real life. Unlike most articles reflecting on the ending, who saw it as a metaphor for Senua learning to live with her illness, Faulkner believed that the ending was magically curing Senua, and condemned the game for it. Edge deplored that Senua's psychosis was depicted as "something of an asset: a helpful superpower that can give you the strength to soldier on through the darkness, so long as you can put up with the odd breakdown here and there." Early in the game, after Senua's hand turns to rot because she got "tainted", the Darkness tells her that every time she "dies" (every death turns out to be a vision of a possible future), the rot will spread further up, until it reaches her head and consumes her soul; the game implies that, if this happens, it will result in a permadeath, as the player's save would be deleted, and all game progress until then would be erased. However, several media outlets later found out that the rot stops spreading after a certain number of deaths, and cannot progress further before a certain point in the game, ultimately making it impossible for it to reach Senua's head. Reid McCarter of PC Gamer strongly defended Ninja Theory's move, calling it "great game design and a modern expression of unreliable narration". He stated "As the story progresses, the nature of the corruption becomes clearer as the player comes to understand a correlation between Senua’s backstory and psychology and the way they perceive the game’s dangers. It is a beautifully executed bit of narrative design, game systems and story working in tandem." PCGamesN called it a "clever decision", as it "focuses on Senua’s own fear of her enemies and degrading mental state". Eurogamer called it "a cool trick that makes the player feel a sense of dread as they're playing the game. Dread, anxiety and death are all themes Hellblade revolves around. It certainly fits". Antoniades said that the permadeath mechanic was a bluff: while the rot will spread on Senua's body over repeated deaths, it will never fully reach her head; the wording they chose to describe this was meant to convey part of the fear associated with mental illness and psychosis directly to the player. Antoniades said "We were looking for ideas of how you introduce fear, and one of those ideas was the permadeath mechanic. It's the only time we're very explicit about what will happen to you in the game." He considered that they believed that players and critics have mistaken their wording on the permadeath mechanic when the game was released, which created a "blowout", but he defended their use of the wording as "it's your interpretation as a player that taints the meaning behind it. That's something we wanted to do on purpose, because with mental illness it's your frame of mind that interprets the world, and that can cause you distress." While only released in digital form, Hellblade: Senua's Sacrifice was a commercial success. It was the best selling game on the PlayStation Store in Europe for the month of its release. According to director Tameem Antoniades the game sold "better than expected" and broke even in approximately three months, ahead of the six to nine months the developers expected. PC Gamer stated about Hellblade's success that "the news can only be positive. Perhaps if other developers see an experimental game like Hellblade finding commercial success then they'll be more likely to take risks on their own titles—and that, ultimately, will lead to more interesting games". To celebrate World Mental Health Day on October 10, 2017, Ninja Theory donated all profit made from the sales of Hellblade on that day to Rethink Mental Illness. By June 2018, the game had sold over a million copies across all three platforms. In addition to the awards received by the game, the team of Hellblade, including Antoniades and Juergens, won the award for Best Real-Time Graphics & Interactivity at SIGGRAPH in 2016, for a showcase demonstration of a technique they called "Realtime Cinematography", during which they performed and filmed live a scene from Hellblade, which was "shot, captured and edited to final quality in minutes, a process that would normally take weeks or months". ^ a b c d e f g h Bell, Alice (August 10, 2017). "Hellblade: Senua's Sacrifice review". VideoGamer.com. Archived from the original on November 14, 2017. Retrieved August 10, 2017. ^ a b c d e f Tyrrel, Brandin (August 7, 2017). "Hellblade: Senua's Sacrifice Review". IGN. Archived from the original on August 29, 2017. Retrieved August 7, 2017. ^ a b c d McKeand, Kirk (August 8, 2017). "Hellblade is frustrating, confusing, and uncomfortable, but that's the point". PCGamesN. Archived from the original on December 23, 2017. Retrieved November 13, 2017. ^ a b c d e f g h Shoemaker, Brad (August 9, 2017). "Hellblade: Senua's Sacrifice Review". Giant Bomb. Archived from the original on September 3, 2017. Retrieved August 9, 2017. ^ a b c Barrett, Ben (August 8, 2017). "Hellblade's permadeath is a bluff". PCGamesN. Archived from the original on October 25, 2017. Retrieved November 13, 2017. ^ a b c d Yin-Poole, Wesley (August 9, 2017). "There's more to Hellblade's permadeath than meets the eye". Eurogamer. Archived from the original on September 23, 2017. Retrieved November 13, 2017. ^ a b c d e f g h i j Lloyd, James (October 10, 2017). "How Hellblade: Senua's Sacrifice deals with psychosis". Science Focus. Archived from the original on August 13, 2017. Retrieved August 16, 2017. ^ Matthews, Dominic (August 12, 2014). "Ninja Theory's Hellbalde announced". Playstation. Archived from the original on August 13, 2014. Retrieved August 12, 2014. ^ a b c McFerran, Damien. "Why Hellblade is the world's biggest indie game". Red Bull Games. Archived from the original on October 15, 2017. ^ a b c "Hellblade sales 'better than expected', will break even months ahead of schedule". PC Gamer. October 30, 2017. Archived from the original on October 29, 2017. Retrieved November 17, 2017. ^ a b McKeand, Kirk (June 6, 2017). "Hellblade: Senua's Sacrifice is only $29.99 - here's why". wcfftech. Archived from the original on July 7, 2017. Retrieved November 18, 2017. ^ Hilliard, Kyle (February 22, 2015). "Heavenly Sword Art Director Returns To Ninja Theory To Work On Hellblade". Game Informer. Archived from the original on May 27, 2015. Retrieved May 19, 2015. ^ Samuel Roberts (January 9, 2015). "Hellblade is coming to PC". PC Gamer. Future plc. Archived from the original on January 8, 2015. Retrieved January 9, 2015. ^ Orland, Kyle (March 16, 2016). "Epic looks outside of gaming for new uses of Unreal Engine". Ars Technica. Archived from the original on December 1, 2017. Retrieved August 12, 2017. ^ Romano, Sal (March 15, 2016). "Hellblade officially subtitled Senua's Sacrifice". Gematsu. Archived from the original on March 17, 2016. Retrieved March 15, 2016. ^ a b "Siggraph 2016 Award Winner Hellblade Shows Impressive Performance Capture Tech". wccftech. July 28, 2017. Archived from the original on October 13, 2016. Retrieved November 17, 2017. ^ a b c d e f g h i j k l m Hellblade: Senua's Psychosis (in-game documentary). Ninja Theory. Ninja Theory. 2017. ^ Frank, Roberta (1984). "Viking atrocity and Skaldic verse: The Rite of the Blood-Eagle". English Historical Review. Oxford Journals. XCIX (CCCXCI): 332–343. doi:10.1093/ehr/XCIX.CCCXCI.332. Archived from the original on February 9, 2016. Retrieved March 30, 2015. ^ Tracy, Larissa (2012). Torture and Brutality in Medieval Literature: Negotiations of National Identity. DS Brewer. pp. 109–111. ISBN 9781843842880. Archived from the original on September 23, 2015. ^ Dash, Mike (18 March 2013). "The Vengeance of Ivarr the Boneless". Smithsonian.com. Smithsonian. Retrieved 30 March 2015. ^ S. Good, Owen (June 10, 2015). "In PS4's Hellblade, hell is a warrior's mental illness". Polygon. Archived from the original on June 12, 2015. Retrieved June 11, 2015. ^ a b c Briers, Michael (August 9, 2017). "Hellblade and Why Mental Illness Needs the Mainstream Spotlight". PlayStationLifeStyle.net. Archived from the original on August 9, 2017. Retrieved August 13, 2017. ^ "Curriculum Vitae". melinajuergens.wixsite.com. Retrieved 3 May 2018. ^ a b c d "Hellblade Development Diary 18: The Shoot Set Up". Ninja Theory. December 4, 2015. Retrieved November 16, 2017. ^ McCarthy, Caty (March 22, 2018). "Hellblade's Budget Required Ninja Theory to Use Their Own Boardroom as a Motion Capture Studio". USGamer. Retrieved March 22, 2018. ^ a b Wallace, Kimberly (June 10, 2015). "Hellblade: Experience The Trials Of Mental Illness". Game Informer. Archived from the original on June 11, 2015. Retrieved June 10, 2015. ^ a b Matulef, Jeffrey (November 30, 2016). "Hellblade: Senua's Sacrifice delayed until next year". Eurogamer. Archived from the original on December 1, 2016. Retrieved November 30, 2016. ^ Crossly, Rob (January 8, 2015). "PS4 "Timed Exclusive" Hellblade Coming to PC Too". GameSpot. Retrieved March 25, 2018. ^ Purchase, Robert (March 25, 2018). "Hellblade coming out very soon on Xbox One, and enhanced for X". Eurogamer. Retrieved March 25, 2018. ^ Wales, Matt (July 25, 2018). "Ninja Theory's remarkable Hellblade: Senua's Sacrifice gets full VR support next week". Eurogamer. Retrieved July 25, 2018. ^ Dornbush, Jonathon (February 13, 2019). "HELLBLADE: SENUA'S SACRIFICE ANNOUNCED FOR NINTENDO SWITCH". IGN. Retrieved February 24, 2019. ^ Hall, Charlie (February 13, 2019). "Hellblade: Senua's Sacrifice coming to Nintendo Switch this spring". Polygon. Retrieved February 24, 2019. ^ "Hellblade: Senua's Sacrifice". Metacritic. Retrieved 2019-04-16. ^ a b "Hellblade: Senua's Sacrifice for PC Reviews". Metacritic. Archived from the original on August 28, 2017. Retrieved August 8, 2017. ^ a b "Hellblade: Senua's Sacrifice for PlayStation 4 Reviews". Metacritic. Archived from the original on September 2, 2017. Retrieved August 8, 2017. ^ "Hellblade: Senua's Sacrifice". Metacritic. Retrieved 2018-05-05. ^ Carter, Chris (August 8, 2017). "Review: Hellblade: Senua's Sacrifice". Destructoid. Archived from the original on August 27, 2017. Retrieved August 8, 2017. ^ a b L Patterson, Mollie (August 8, 2017). "Hellblade: Senua's Sacrifice review". EGMNow. Archived from the original on August 8, 2017. Retrieved August 8, 2017. ^ a b c Juba, Joe (August 8, 2017). "Seeing Through The Fog - Hellblade - PlayStation 4". Game Informer. Archived from the original on August 9, 2017. Retrieved August 8, 2017. ^ Fillari, Alessandro (August 8, 2017). "Hellblade: Senua's Sacrifice Review". GameSpot. Archived from the original on August 9, 2017. Retrieved August 8, 2017. ^ a b c d Johnson, Leif (August 8, 2017). "Hellblade: Senua's Sacrifice review". PC Gamer. Archived from the original on August 8, 2017. Retrieved August 8, 2017. ^ Palumbo, Alessio (August 19, 2017). "Hellblade: Senua's Sacrifice Review – An Independent Masterpiece with AAA Quality". wcfftech. Archived from the original on September 2, 2017. Retrieved November 18, 2017. ^ Johnson, Lief (September 19, 2017). "Games like Hellblade are eroding the border between indie and triple-A". PC Gamer. Archived from the original on November 14, 2017. Retrieved November 18, 2017. ^ a b "Hellblade: Senua's Sacrifice (negative reviews)". Metacritic. Archived from the original on February 26, 2018. Retrieved November 16, 2017. ^ Eurogamer staff (December 30, 2017). "Eurogamer's Top 50 Games of 2017: 10-1". Eurogamer. Archived from the original on December 31, 2017. Retrieved December 30, 2017. ^ GamesRadar staff (December 22, 2017). "The best games of 2017". GamesRadar+. Retrieved March 25, 2018. ^ EGM staff (December 28, 2017). "EGM's Best of 2017: Part Two: #20 ~ #16". EGMNow. Archived from the original on January 14, 2018. Retrieved January 14, 2018. ^ Polygon staff (December 18, 2017). "The 50 best games of 2017". Polygon. Archived from the original on December 21, 2017. Retrieved February 12, 2018. ^ "Best of 2017 Awards: Best PC Game". IGN. December 20, 2017. Archived from the original on December 25, 2017. Retrieved January 8, 2018. ^ "Best of 2017 Awards: Best PlayStation 4 Game". IGN. December 20, 2017. Archived from the original on December 23, 2017. Retrieved January 8, 2018. ^ "Best of 2017 Awards: Best Action-Adventure Game". IGN. December 20, 2017. Archived from the original on January 8, 2018. Retrieved January 8, 2018. ^ "Best of 2017 Awards: Best Graphics". IGN. December 20, 2017. Archived from the original on January 8, 2018. Retrieved January 8, 2018. ^ "Best of 2017 Awards: Best Story". IGN. December 20, 2017. Archived from the original on January 1, 2018. Retrieved January 8, 2018. ^ "Best of 2017 Awards: Most Innovative". IGN. December 20, 2017. Archived from the original on January 2, 2018. Retrieved January 8, 2018. ^ Faulkner, Jason (August 15, 2017). "'Hellblade' tries to show the real experience of psychosis — but ends up using it as a plot device". Mic. Retrieved November 17, 2017. ^ McCarter, Reid (August 11, 2017). "How Hellblade's permadeath works isn't the point". PC Gamer. Archived from the original on August 21, 2017. Retrieved November 13, 2017. ^ Purslow, Matt (May 17, 2018). "Hellblade's permadeath bluff is "not as simple as people think"". PCGamesN. Retrieved May 17, 2018. ^ "Hellblade: Senua's Sacrifice was the bestselling game on PlayStation Store in August". PlayStation Blog. September 8, 2017. Archived from the original on October 24, 2017. Retrieved November 18, 2017. ^ "Hellblade Was the Most Downloaded PS4 Game During August In Europe". PlayStation LifeStyle. September 8, 2017. Archived from the original on October 20, 2017. Retrieved November 17, 2017. ^ "Hellblade: Senua's Sacrifice Has Almost Broken Even in Sales". PlayStation LifeStyle. October 27, 2017. Archived from the original on November 19, 2017. Retrieved November 18, 2017. ^ "All proceeds from sale of Hellblade: Senua's Sacrifice tomorrow will go to UK mental health charity". PC Gamer. October 9, 2017. Archived from the original on October 10, 2017. Retrieved November 17, 2017. ^ Campbell, Evan. "Hellblade: Senua's Sacrifice Has Sold 1 Million Copies". IGN. Retrieved 22 June 2018. ^ "TIGA Awards - 2017 winners". The Independent Game Developers' Association. Archived from the original on February 26, 2018. Retrieved November 17, 2017. ^ Weber, Rachel (November 17, 2017). "The Legend of Zelda: Breath of the Wild scores big at the 35th Golden Joystick Awards presented with OMEN by HP". GamesRadar+. Retrieved November 17, 2017. ^ "ALL THE NEWS, TRAILERS, AND WINNERS FROM THE GAME AWARDS 2017". IGN. December 8, 2017. Archived from the original on December 8, 2017. Retrieved December 8, 2017. ^ Hester, Blake (November 14, 2017). "'Horizon Zero Dawn,' 'Zelda,' 'Mario' Top List of Game Award Nominees". Glixel. Archived from the original on November 14, 2017. Retrieved November 14, 2017. ^ "Writers' Guild Awards winners 2018". Writers' Guild of Great Britain. January 15, 2018. Retrieved July 3, 2018. ^ Whitney, Kayla (January 25, 2018). "Complete list of winners of the New York Game Awards 2018". AXS. Archived from the original on January 27, 2018. Retrieved January 27, 2018. ^ Hipes, Patrick (December 4, 2017). "Annie Awards: Disney/Pixar's 'Coco' Tops Nominations". Deadline Hollywood. Archived from the original on December 5, 2017. Retrieved December 4, 2017. ^ Pedersen, Erik; Haithman, Diane (February 3, 2018). "'Coco' Dominates Annies; 'Rick And Morty' Tops TV: Complete Winners List". Deadline Hollywood. Archived from the original on February 4, 2018. Retrieved February 4, 2018. ^ Makuch, Eddie (February 22, 2018). "Legend Of Zelda: Breath Of The Wild Wins Game Of The Year At DICE Awards". GameSpot. Archived from the original on February 23, 2018. Retrieved February 23, 2018. ^ "2018 SXSW Gaming Awards nominees". SXSW. ^ Gamasutra staff (January 5, 2018). "Breath of the Wild & Horizon Zero Dawn lead GDC 2018 Choice Awards nominees!". Gamasutra. Archived from the original on January 8, 2018. Retrieved January 8, 2018. ^ Makuch, Eddie (March 21, 2018). "Legend Of Zelda: Breath Of The Wild Wins Another Game Of The Year Award". GameSpot. Retrieved March 22, 2018. ^ McAloon, Alissa (May 31, 2018). "Bury Me, My Love and MyoBeatz among 2018 Games for Change Awards nominees". Gamasutra. Retrieved July 2, 2018. ^ Fogel, Stefanie (June 29, 2018). "'Life Is Strange: Before the Storm' Wins Big at Games for Change Awards". Variety. Retrieved July 2, 2018. ^ "Nominations Announced for the 2018 Ivor Novello Awards". Ivor Novello Awards. April 24, 2018. Retrieved August 31, 2018. ^ Barton, Seth (July 12, 2018). "The Develop Awards 2018: All the winners!". MCV. Retrieved September 4, 2018. ^ Hoggins, Tom (September 24, 2018). "Golden Joysticks 2018 nominees announced, voting open now". The Daily Telegraph. Retrieved November 17, 2018. ^ Sheridan, Connor (November 16, 2018). "Golden Joystick Awards 2018 winners: God of War wins big but Fortnite gets Victory Royale". GamesRadar+. Retrieved November 17, 2018. This page was last edited on 16 April 2019, at 18:51 (UTC).